Some people needlessly worry about getting enough iron on a vegetarian diet. Just as with the other myths about vegetarian diets, such as the not getting enough protein or calcium myths, you can be assured there’s nothing to worry about on all counts. Medical studies show that iron deficiency anemia is no more common among vegetarians and vegans than among the general population. One source of confusion stems from the two kinds of dietary iron: heme iron and non-heme iron. Meat contains both heme and non-heme iron whereas plant foods contain only non-heme. It was once thought that heme iron was better for us in some way and that non-heme iron was hard to absorb. We now know better. It turns out that non-heme iron is well absorbed because many other substances in food, such as vitamin C, citric acid and malic acid, widely available in both fruits and vegetables, greatly increase its absorption. Even spices such as garlic can greatly increase the absorbability of non-heme iron, especially from grains. Another theoretical worry was that substances known as phytates would inhibit the absorption of non-heme iron. But here again it turns out that there’s nothing to worry about. It seems that the good bacteria in our digestive tracts almost completely degrade the phytate so that’s not a problem either. See our recent posting on this topic. While there is no problem with non-heme iron, there are however some distinct advantages to it. When you get your iron from plant sources, you don’t have to worry about all that cholesterol, saturated fat, and the cancer-causing toxic chemicals that concentrate in meat and that are formed whenever meat is cooked. You also help protect against obesity because it costs far fewer calories to get your iron from plant foods than animal foods. 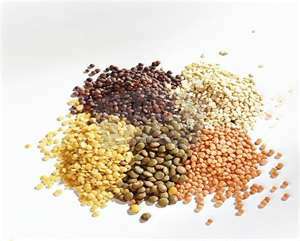 For example, lentils have 2.9mg iron per 100 calories, compared with hamburger which has just 0.8mg iron per 100 calories. Chickpeas, collard greens, and broccoli are just some of the other plant foods that come in above beef for iron content on a per calorie basis. If you prefer to compare by weight, 4oz lentils have 3.6mg of iron, compared to 3.2mg for a quarter pounder (4oz) of hamburger. Recommended daily amounts of iron are different for different groups of people. For example a menstruating woman needs 18mg daily, a pregnant woman needs 27mg, whereas adult men and post-menopausal women only need 8mg each day. On food packages iron is listed as the percentage of 18mg. Vitamin/mineral supplements also consider 18mg as 100%. As you can see this recommended daily allowance is confusing, since men and post-menopausal women need so much less. Iron is widely distributed among plant foods as can be seen from the chart below. With such a wide variety of plant foods that contain iron, you’ll have no trouble getting all the iron you need for optimum health on a vegetarian diet.